The IDF soldier who was injured in a shooting attack in Hevron Sunday night has died of his wounds. 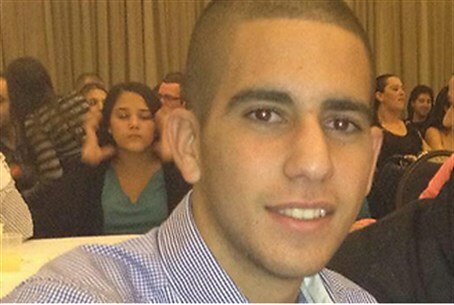 The soldier was identified as 20 year old Gabriel (Gal) Kobi of Tirat Hacarmel. Funeral arrangements would be announced later Sunday night, the IDF said. The attack took place in the Avraham Avinu neighborhood near the Machpelah Cave in the city, at about 6:30 PM. A Magen David Adom crew treated the victim, who was struck by bullets in his upper body. He was later taken by helicopter to Hadassah Ein Kerem Hospital in Jerusalem. IDF troops were searching for the perpetrator in the area. The army is investigating the possibility that the attack was carried out by a sharpshooter who hid between buildings in an Arab neighborhood next to the Jewish section of the city, and fired in the direction of Jews. Tens of thousands of people are expected in Hevron this week. Jewish residents of Hevron said that despite the shooting, all activities that had been planned will go on. Prior to news of the soldier's death, Bayit Yehudi (Jewish Home) MK Orit Strook, who lives in the Avraham Avinu neighborhood, said that “we are all praying for the health of the injured soldier." "We have not had a holiday like this for years, in which one tragedy follows another,” Strook said, referring to the murder of IDF soldier Yaakov Hazan on Friday by a terrorist in Samaria. “The government must reconsider its policy on releasing terrorists, which leads to more terror attacks." “As the Arab terror attackers seek to dispel the joy of the Sukkot holiday and the Jewish presence in Hevron, I am sure that the healthy public response of tens of thousands of Jews who are set to come here this week will win out,” she added. In light of Sunday's shooting, Economics Minister Naftali Bennett is demanding a review of the government's policy on releasing terrorists. In a letter to government secretary Avihai Mandelblit, Bennett demanded that the government authorize immediately the entry of Jews into the Machpelah Cave in Hevron. “The negotiation 'celebration' the government is holding with the PA has turned into a 'celebration' of blood and death for Jews during the holiday of Sukkot,” he wrote. “Since the release of terrorists was the key to the opening of negotiations, the unfortunate developments behoove the government to rethink its position on the matter. The answer to terror must be a fight against murderers, not a dialog with them,” he said. Speaking Sunday night, a top Hamas terrorist said that PA Arabs were “on the verge of a third intifada.” Musa Abu Marzouk said that PA Arabs were planning more attacks against Israelis, similar to those of the past several days, in which two IDF soldiers were killed. Israeli security officials said that in recent days posters and fliers have appeared in PA cities calling for a “day of rage” on Friday, marking the 13th anniversary of the beginning of the second intifada.